Are you afraid of speaking in public? Studies done on the topic show that more people are afraid of public speaking than they are of death. Imagine how much worse it would be if they asked people about giving a speech in a foreign language. Giving a speech in a foreign language can be a stressful experience but it doesn’t have to be that way. Making the right preparations will help you gain confidence and practicing will help you overcome your fear of speaking in public. 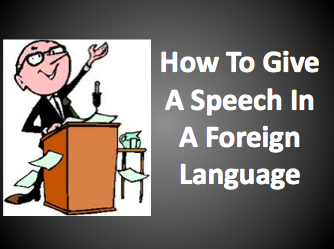 So what should you do to prepare for a speech in a foreign language? The most important thing to consider when preparing for a speech is who you will be giving the speech to. What kinds of people are going to be sitting in the audience? Where do they come from? What is their professional and educational background? How much do they know about your speech topic? The answers to these questions will help you decide what to speak about. The speech you would give to a group of high schoolers is different than the speech you would give to a group of accountants in their 40’s. The vocabulary and examples that would be used in a speech to a group of 16 year olds is much different than what would be used for the 40 year old accountants. If you gave the same speech to both of them, at least one of the groups will not receive your speech as well as they would’ve if you had tailored your speech to who you are speaking to. When writing your speech, remember to keep in mind who is your audience. If they’re Brazilian, are they going to understand the cultural references that you make? If they’re not Brazilian, are they going to know the soccer player that you are referring to? Making references to soccer might work when talking to Brazilians, but it would be better to make references to baseball when talking to Americans. It is important to have a good grasp of the culture that your audience comes from in order to be able to relate to them. Keep your audience in mind when you are choosing which vocabulary you will use in your speech. Will your audience appreciate the advanced technical jargon you are using, or would they prefer a more simple explanation? If the language you are giving the speech in is a second language for your audience members as well, it might be a good idea to simplify the vocabulary you use, and translate words that they aren’t likely to know. Once you have your speech prepared the next step is to start practicing. Get in front of a camera and give your speech as if you were in front of an audience. Recording your speech allows you to see yourself the way your audience is going to see you. You will be able to see your body language and you’ll hear your accent, your pronunciation and your tone of voice. It may be painful to listen to yourself speak, but going through this process is worth it for the self-awareness you will gain. Next its time to make corrections to your speech. You will undoubtedly have noticed ways that you could have worded a part of your speech better, and you will have found errors in your pronunciation. While one or two errors aren’t a big deal, if you are consistently making the same mistakes your audience may perceive you as being less authoritative about your subject matter. It may be benefitial to get a second opinion on your speech. Find a native speaker of the language your speech is in and ask them to listen to your speech. Ask them to help you with your pronunciation, word choice and intonation. They will also be able to tell you if the examples you use in your speech will be relevant to other native speakers of that language. By now, you should have made so many changes to your speech that it is almost unrecognizable from before. Record yourself giving your speech in front of a camera again and see if you are still making the same mistakes. Repeat this process as many times in front of the camera as needed until you are comfortable with your performance. The more you practice the more comfortable you will be giving your speech. Your audience will see your confidence and they will take you more seriously. The big day has finally arrived and its time to give your speech. It’s a good idea to start your day off by listening to people speak the language your speech is in. Listening to a podcast on your way to work is a good option. Another idea would be to listen to the best recording of you giving the speech, that way its fresh in your mind. Before you give your speech you should give the audience a disclaimer that English is not your first language. At some point during your speech you’re probably going to mispronounce a word, or use a phrase incorrectly. Let them know at the beginning of your speech that its ok to ask for clarification if they don’t understand you. While giving your speech, be mindful of your use of “uh” and “um.” This signifies a lack of knowledge and confidence. Make strong eye contact with your audience. Most importantly, slow down when you talk. When you talk faster your native accent comes out. You may think that people will think you’re more fluent by talking faster, but this just makes it harder to understand you. Keep calm and stay focused on your speech. Deliver it to your audience the same way that you delivered it a hundred times to your camera. If you make mistakes, don’t worry about them and continue giving your speech. Before you know it, it will all be over. As you listen to their applause, congratulate yourself for the outstanding job you’ve done giving a speech in a foreign language. In summary, accessing your audience is the most important step when preparing for a speech in a foreign language. You should practice in front of a camera in order to overcome your fear of talking in public. Have a native speaker help you improve your pronunciation, word choice and cultural references. The more time you spend working to improve your speech, the more your audience will be impressed by what you have to say. Great tips Josh. It is good to see you so actively helping people to speak English, and to succeed in life. You guys Rock!